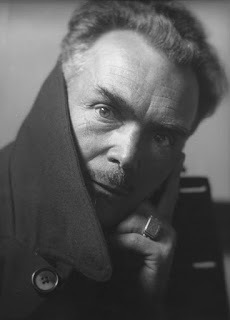 Alexander Kaun, 1932 by Johan Hagemeyer. Courtesy Johan Hagemeyer Collection, Bancroft Library, UC-Berkeley. One of the more fascinating lifelong friends in the orbit of architect R. M. Schindler and his wife Pauline was nationally renowned Russian art and literary scholar Alexander "Sasha" Kaun. The Schindlers befriended him in Chicago while the Russian born Kaun was studying for his PhB at the University of Chicago, editing and writing for the school's Chicago Literary Review while frequently contributing to Margaret Anderson's avant-garde The Little Review. (For much more on this see my "The Schindlers and the Westons and the Walt Whitman School"). Alexander S. Kaun, Cap and Gown, University of Chicago, 1916, p. 88. The below obituary by his Berkeley colleague G. R.Noyes sums up his remarkable career in a nutshell. "In the spring of 1913 he studied at the Lewis Institute in Chicago and in the fall of that year he entered the University of Chicago, from which he graduated in 1916. In the summer of that year he lectured on Russian literature at the University of Chicago. On January 20, 1916, he married Valeria Gretchen Tracewell, of Columbus, Kansas. Early in 1917 for the sake of his health he removed to Berkeley, California. In the summer he lectured in the University of California Summer School. He was appointed Assistant in Russian at the University of California for the year 1917-18 and at the same time enrolled as a graduate student. In 1918 he received the degree of M. A. in Slavic Languages and in 1923 the degree of Ph. D. After 1917 he spent his entire life as a member of the Department of Slavic Languages at the University of California, becoming Instructor in Russian in 1919, Associate in Russian in 1920, Assistant Professor of Russian in 1923, Associate Professor of Slavic Languages in 1927, and Professor of Slavic Languages in 1943. In 1942 he was appointed chairman of the department." 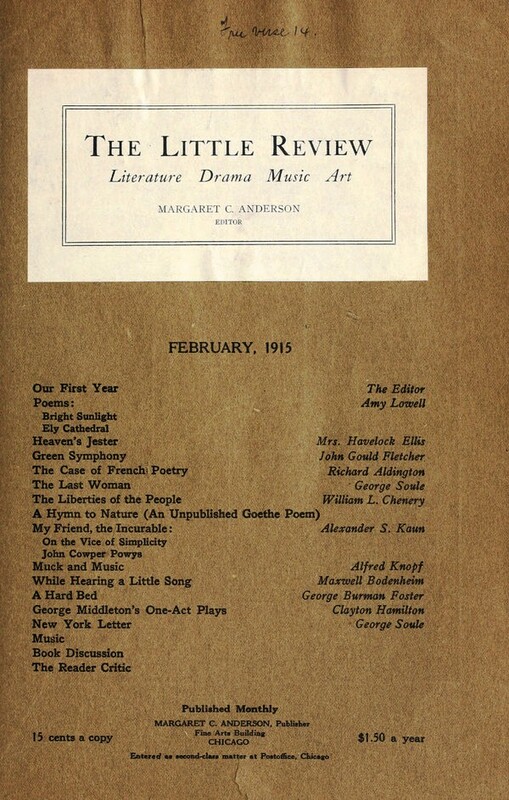 The Little Review, February 1915. 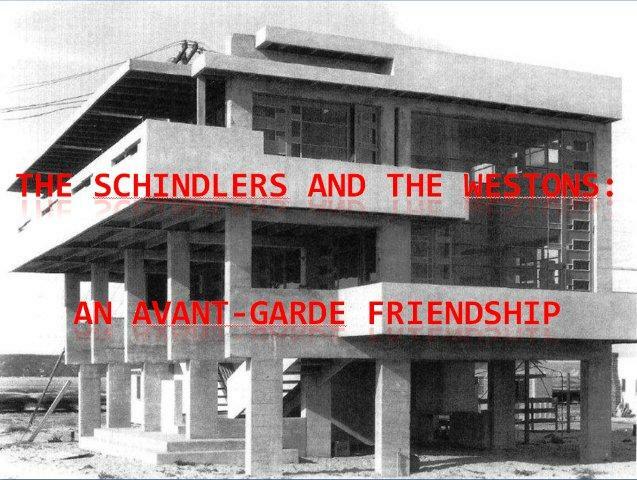 After the Schindlers completed their Kings Road House in West Hollywood in 1922 the Kauns were frequent visitors. Kaun often lectured at the Schindler's salons throughout the late 1920s and early 1930s. Kaun Beach Cottage, Richmond, 1935, R. M. Schindler, architect. Courtesy UC-Santa Barbara Architecture and Design Collections, Schindler Papers. Kaun and his artist wife Valeria were highly respected members of the UC Berkeley faculty and Berkeley arts and literary community as well. Valeria was instrumental in helping Schindler publicize his 1933 one-man exhibition at the de Young Museum in San Francisco. Her work was exhibited concurrently in a companion exhibition (see below for example). This friendship opened many doors for the Schindlers' mutual friend Galka Scheyer, art dealer for the Blue Four while she was establishing a foothold in the Bay Area, especially Berkeley, in the late 1920s. (For much more on this see my "Schindler-Scheyer-Eaton-Ain: A Case Study in Adobe."). "Unfound Genius at Toil," Oakland Tribune, November 29, 1927, p. 4. Noyes ended his heartfelt piece fondly reminiscing about collegial time spent at the Kaun's Schindler-designed beach cottage on a sandy cove in a Eucalyptus grove on Point Richmond. "I like best to picture him entertaining our little Slavic Society, to which all the students of any Slavic language might belong - and most of them did belong - at his "private Riviera," a rather chilly little beach adjoining his cottage at Richmond. The boys and girls toasted wienies, bathed in the turbid water, played ball, were happy. And Sasha Kaun and Valeria knew how to make them happy; they mingled with them without affectation or condescension; they were boy and girl along with them." (Noyes, G. R., "Alexander Kaun," Books Abroad, October 1944, p. 322). 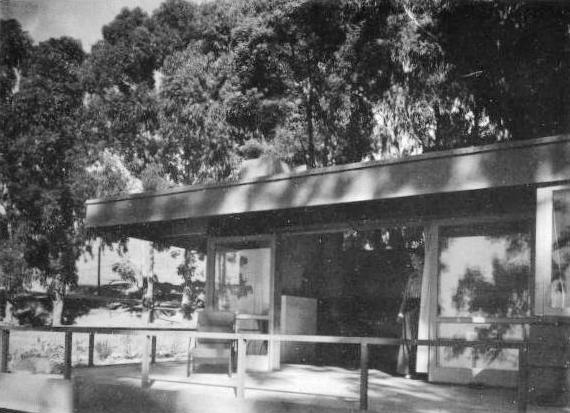 Kaun Beach Cottage, Richmond, 1935, R. M. Schindler, architect. From "House for Dr. Sasha Kaun, San Francisco Bay, R. M. Schindler, Architect," Architectural Forum, November 1936, pp. 422-23. Note Valeria Kaun standing in the doorway. Courtesy UC-Santa Barbara Architecture and Design Collections, Schindler Papers. Architect and Engineer, December 1935 guest-edited by Pauline Schindler. 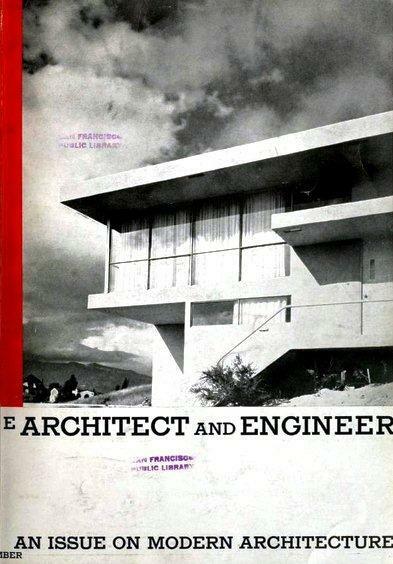 R. M. Schindler's Oliver House on the cover. The Kauns next door beach neighbors, the Shaws, around the same time commissioned a similar cottage by fellow modernist William W. Wurster on their shared intimate cove on Point Richmond. 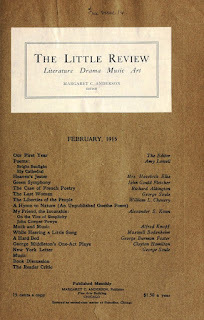 Pauline Schindler featured both cottages in the December 1935 issue of Architect and Engineer for which she was the guest editor (see above and below). (For more details see my "Pauline Gibling Schindler: Vagabond Agent for Modernism"). 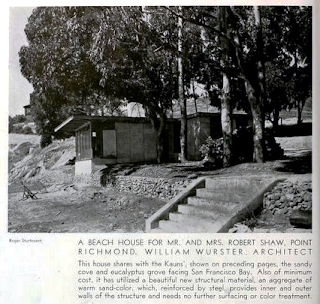 "A Beach House for Mr. and Mrs. Robert Shaw, Point Richmond, William Wurster, Architect, Architect and Engineer, December 1935. It is perhaps with shared knowledge of Russia from Kaun that fellow Schindler clients and salon coterie Philip Lovell and Leo Gallagher felt emboldened to make a trip to Russia in 1931. In any event they would have compared notes with Kaun upon their return. This will all be rolled up into my below overarching work in progress, The Schindlers and the Westons: An Avant-Garde Friendship." Lovell Beach House, Newport Beach, 1926, R. M. Schindler, architect. Photo by Edward Weston, August 2, 1927. Courtesy UC-Santa Barbara Architecture and Design Collections, Schindler Papers.